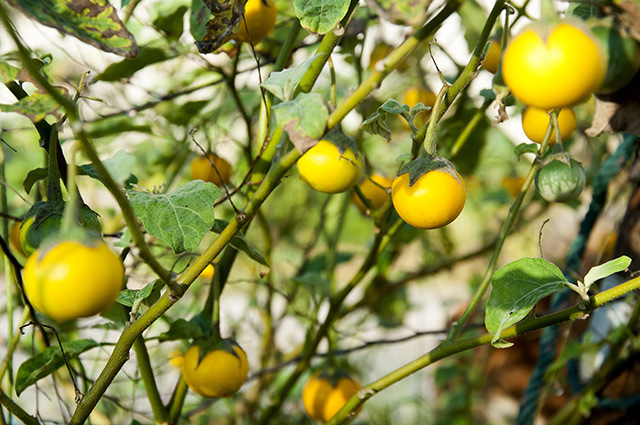 The sodaapple nightshade (Solanum aculeastrum), a medicinal plant found in tropical Africa, contains potential anti-cancer activity, according to a study led by South Africa’s Council for Scientific and Industrial Research, together with the University of Pretoria. The study, which appeared in BMC Complementary and Alternative Medicine, looked at the uses of the sodaapple nightshade, especially in alternative therapy, as some patients with cancer consume the fruit to complement conventional treatments. The sodaapple nightshade, in particular, its fruit, is used as a soap substitute, thanks to its high levels of saponin. The fruit, which is also used in traditional medicine, contains solanine, a toxic chemical found in most plants in the nightshade family like potatoes and eggplants; however, the amounts that are present in these food items do not pose a significant risk. Earlier studies of the sodaapple nightshade have also concluded that the fruits had antimicrobial activity and have been used in traditional medicine. In this study, researchers looked at solamargine. This compound has health-promoting properties though, in high concentrations, can also have adverse effects. From the fruit of the sodaapple nightshade, the team obtained a crude extract and further processed it to get aqueous and organic fractions. The water-based fraction was then subjected to further tests to isolate bioactive constituents, which were identified and studied. Researchers used multiple assays to determine two things: whether the extract and the fractions were cytotoxic (harmful to cells) and if they could inhibit P-glycoprotein (P-gp), a plasma membrane protein which actively transports drugs out of the cell and enables drug resistance. The findings revealed that all derivatives from the nightshade were cytotoxic to all cancer cell lines. In particular, solamargine induced apoptosis (cell death) and regulated cell death in human lung cancer cells. According to researchers, this meant that solamargine could reduce the likelihood of metastasis by decreasing a cancer cell’s invasive and migratory potential. The team concluded that both the crude extracts and the fractions that were obtained from the sodaapple nightshade had damaging effects to cancerous cell lines, based on multiple assays. Further studies, according to researchers, should focus on the mechanism of action of these bioactive ingredients to determine how they can be used in alternative treatments. Here are just some of the nutritious nightshades people regularly consume. Tomatoes. Lycopene, the carotenoid that gives the fruit its distinct red color, can help reduce the risk of certain cancers. Potatoes. These kitchen staples are rich in vitamins A, B, C, and E, as well as iron and zinc – as long as they’re not fried or riddled with salt. Bell peppers. Bell peppers are abundant sources of vitamin C.
It goes without saying, of course, that people shouldn’t eat the fruit of the deadly nightshade – as little as two small berries can easily kill a young child. Learn more about sodaapple nightshade and its benefits by following Herbs.news today.